Extremely strong, thin and sensitive mono, coloured in brown recluse, this thin diameter mono will cast and handle like a dream. 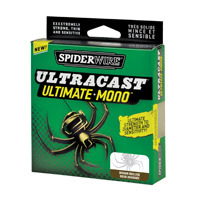 Ultracast mono has excellent knot strength and very little stretch!  Breakthrough strength to diameter copolymer is 33% stronger than the average mono.  Unprecedented 15% stretch for incredible sensitivity and hook setting power.  Thin diameter allows exceptional bait action and high line capacity.  Excellent knot and shock strength - even when wet.  Optimised for baitcast reels, but still castable and manageable on spinning reels.  15% stretch making it incredibly sensitive.